Figure 3.10 Visible absorption spectra of colloidal titanate nanotubes of differing mean internal diameter: 1) 2.5 nm, 2) 3.1 nm, 3) 3.5 nm, and 4) 5 nm. Path length: 1 cm and temperature: 25 °C. The curves are shifted vertically for clarity. (Data are adapted from ref. 53). estimated value for the band gap of titanate nanotubes is approximately 3.87 eV. The position of the two features in the spectra and the apparent band gap do not change for nanotube samples of different internal diameter, indicating the absence of systematic size-dependent changes. 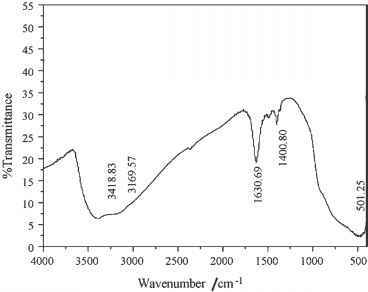 These absorption spectra are also similar to the spectra of titanate nanotubes suspended in absolute ethanol solution,56 but contrast with the diffuse reflectance spectra obtained from solid films, in which the effect of elastic light scattering can cause additional error. Usually an increase in the average internal diameter of titanate nanotubes results in an increase in the average thickness of the multilayered nanotube wall, which is proportional to the number of layers in the wall. Recently,93 it has been observed that an increase in the number of layers in multilayered lepidocrocite titanate films (produced by the deposition of single layer nanosheets) does not change the electronic structure of this film, which is similar to the case of single layer nanosheets. The stacking of several nanosheets does not affect the electronic properties of the solid, probably as a result of the weak electronic interaction between layers. A similar situation of weak interaction between different layers is likely to exist in the case of multilayered titanate nanotubes. Figure 3.11 Photoluminescence spectra of colloidal titanate nanotubes of differing mean internal diameter: 1) 2.5 nm, 2) 3.1 nm, 3) 3.5 nm, and 4) 5nm. Temperature: 22 °C, excitation wavelength: 237 nm and slit width: 5nm; the wavelength range of 455-490 nm is omitted due to the high signal of the second harmonic from scattered excitation light. The curves are shifted vertically for clarity. 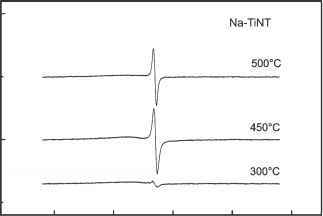 5) Vertical lines show the position of peaks in PL spectrum of titanate nanosheets. (PL spectra are adapted from ref. 53 for nanotubes and ref. 49 for nanosheets). 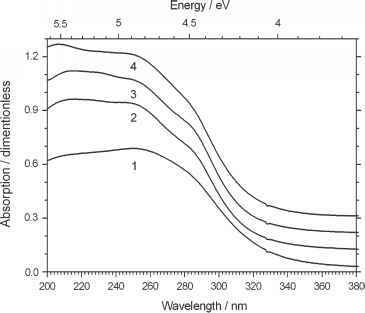 Figure 3.11 shows the photoluminescence spectra of aqueous colloids of titanate nanotubes with average internal diameters varying from 2.5 nm to 5nm.53 The spectra show several sharp bands across a wide range of wavelengths. The positions and relative intensity of all of these bands are practically identical and do not depend on the average internal diameter of nanotubular titanates. 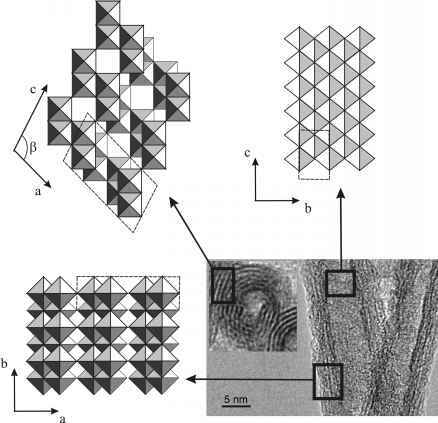 The shape and position of some peaks in the luminescence spectrum are similar to the peaks in the luminescence spectrum of the colloidal solution of exfoliated lepidocrocite titanate nanosheets,49 see Figure 3.11.(5). The best match is exhibited for peaks at shorter wavelength (300-400 nm). At longer wavelengths (500-600 nm), the luminescence peaks for the nanotubes differ from those of the nanosheets. This could be attributable to the nature of these low energy states as cations can be incorporated between two or more nanosheets57 and the spectra consequently depend on the composition of surrounding media. Indeed, titanate nanotubes produced by hydrothermal alkali treatment contain a residual amount of sodium ions,58 whereas nanosheets produced by the exfoliation of layered titanates can be contaminated with caesium and tetrabutylammonium ions.50Since luminescence from low energy states is very sensitive to the presence of cations in the solution, the differences in the luminescence spectrum between nanotubes and nanosheets at longer wavelengths may be due to cation incorporation. The independence of bandgap and energy levels positions on the diameter of nanotubes, as well as the spectral similarities between nanotube and nano-sheets, suggest that all values for energy differences, DEG, in Equation (3.11) are relatively small when compared with the accuracy of experiments. Indeed, the effective mass of charge carriers in bulk TiO2 crystals is relatively large. According to different sources, the effective masses of electrons, me, can vary between 5m0 (ref. 59) and 30m0 (ref. 60), and the mass of holes, mh, is greater than 3m0 (ref. 48,61). Taking me = 9m0 and mh = 3m0 and using Equation (3.11), a difference of 8 meV in the energy gap of nanotubes of diameter 2.5 and 5 nm can be obtained. The energy difference between the two first peaks in the density of states G1D(E) (see Figure 3.9) is <24meV for d = 2.5 nm, and 6meV for d = 5 nm. The values obtained are too small to be resolved in experiments at ambient room temperature. Both the shift of band gaps and the G1D(E) peaks should be completely smeared by thermal fluctuations that have an amplitude kT = 26 meV. The oxidation state of titanium in titanate nanotubes is predominantly equal to 4 + , however some impurities of Ti31 ions in the lattice of titanate can be formed under calcination in vacuum. Figure 3.12 shows the electron spin resonance (ESR) spectra62 of protonated and sodium titanate nanotubes annealed at elevated temperatures in a vacuum. The titanate nanotubes produced do not usually have paramagnetic signals. However, calcination of the sample in air may result in the appearance of a symmetrical peak characterised by g = 2.003 in the ESR spectrum, which can be attributed to the signal from single-electron-trapped oxygen vacancies (SETOV).63 The maximum intensity of the SETOV signal is usually detected at 450 °C, when the transformation of titanate to anatase occurs (see Chapter 4 for information about the temperature stability of nanotubes). Calcination of H-TiNT in a vacuum results in the appearance of symmetrical (g = 2.003) and asymmetrical (g = 1.98) signals in the ESR spectrum (see Figure 3.12a; ref. 62). The latter is usually associated with the reduction of Ti41 to Ti31 ions on the surface of TiO2, accompanied by the removal of oxygen atoms from lattice, 64 which is consistent with the disappearance of this signal after a long exposure of samples in an air atmosphere. In contrast, calcination of sodium titanate nanotubes results in the appearance of the SETOV signal only (see Figure 3.12b), due to the possible improved stability of sodium saturated nanotubes towards the removal of oxygen atoms. Figure 3.12 ESR spectra of calcined titanate nanotubes under vacuum conditions: a) protonated titanate nanotubes and b) sodium titanate nanotubes. (Spectra are adapted from ref. 62). a binding energy of 459.5 eV can be attributed to the Ti14 2p3/2 state. The reduction of Ti41 to Ti31 ions results in the shift of this peak to lower energies.66 In Figure 3.13a, the peak at 459.1-459.4 eV is associated with Ti41 cations, while the small peak at 457.5-458.1 eV corresponds to reduced Ti31 ions. The ratio of Ti31 to Ti41 ions increases from 0.026 at 110 °C to 0.06 at 500 °C,65 this suggests the removal of oxygen atoms from the lattice and the partial reduction of titanate nanotubes under anaerobic conditions at elevated temperatures. Surprisingly, even uncalcined samples have Ti31 ion impurities. Figure 3.13 Photoelectron spectra of titanate nanotubes: a) calcined at 500 °C under a nitrogen atmosphere, Ti2p range, and b) annealed at various temperatures in air, O 1s range. (Data are adapted from refs. 65 and 67). XPS spectroscopy also helps to reveal the nature of the oxygen states in titanate nanotubes. 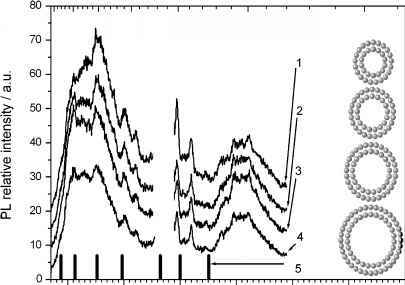 Figure 3.13b shows O 1s signals in the XPS spectra of titanate nanotubes annealed at different temperatures under an air atmosphere.67'68 This XPS signal can be deconvolved into four subpeaks at at 531.14, 530.24, 529.44 and 528.64eV, which can be attributed to H2O, -OH, Ti-O and an unidentified peak, respectively.67 When the tubes are annealed at 300 °C, the intensity of the H2O peak is reduced due to evaporation of both physically adsorbed and crystallographic water. The unidentified peak also disappears. 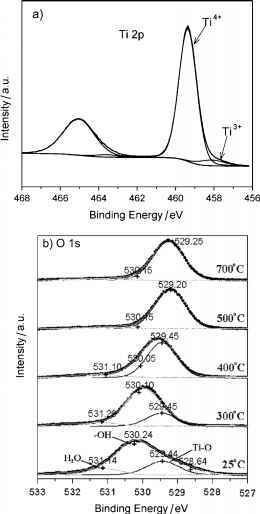 The intensity of the -OH bonding peak decreases, with the increase of the Ti-O peak intensity when annealed at 400 °C, probably due to the dehydration of interlayer OH groups and thus phase conversion to the nanorods of the anatase phase. Above 500 °C, only the main peak assigned to Ti-O at 529.2 eV is observed. 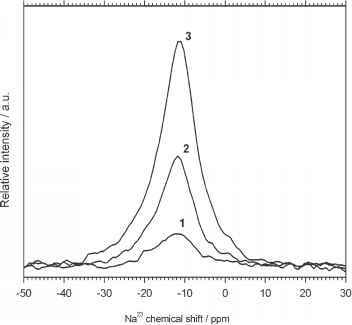 Figure 3.14 H1 MAS NMR spectra of protonated titanate nanotubes which have been ion-exchanged with NaOH at 1) pH = 2, 2) pH = 9 and 3) pH = 13, followed by drying at 140 °C. (Several peaks in the chemical shift region of 1.3 ppm are signals from the NMR rotor). the presence of sodium ions. In contrast, the addition of sodium ions results in an increase in the amount of crystallographic water, which is consistent with recent XRD studies,70 as well as a change in the local magnetic field shielding, due in all probability to the close distance between the protons in crystallographic water and the exchanged sodium ions. The abundance of OH groups in titanate nanotubes can also be confirmed by infrared spectroscopy measurements. Figure 3.15 shows typical FTIR spectrum of protonated titanate nanotubes.71,72 The presence of crystallographic water molecules in the sample is confirmed by the appearance of a characteristic peak at 1630 cm-1, that can be assigned to the H-O-H deformation mode (5H-O-H). The profile of these two bands also suggests a complex hydrogen bond environment in titanate nanotubes. The wide band at 501 cm"1 can be assigned to the crystal lattice vibration of TiO6 octahedra, which can also be strongly affected by the incorporation of ions (via ion-exchange) into the titanate nanotubes,32,72 or by the alteration of nanotubular morphology, including the diameter of the nanotubes. 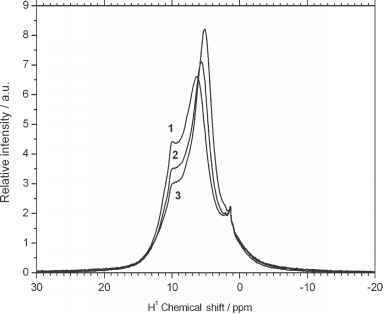 Na 3 MAS NMR spectra of protonated titanate nanotubes which have been ion-exchanged with NaOH at: 1) pH = 2, 2) pH = 9 and 3) pH = 13. Figure 3.16 An FTIR spectrum of protonated titanate nanotubes. (Spectra are adapted from ref. 71). The increase of sodium content in titanate nanotubes does not affect the position and the width of the resonance signal from Na23 nucleuses (see Figure 3.16) suggesting a small interaction between the ions due to the large distance. The chemical shift of the single peak is ca. -12ppm and the peak full width at half maximum height (FWHM) is approximately 10.7 ppm. Figure 3.17 A typical Raman spectrum of titanate nanotubes. (Spectra are adapted from ref. 73). semiconductor. For titanate nanotubes, the existence of labile ion-exchangeable protons suggests that this material should have pronounced proton conductivity. Using AC impedance spectroscopy, it was demonstrated77 that proton conductivity dominated at temperatures below 130 °C in air as a pressed powder pellet of titanate nanotubes. The value of conductivity was ca. 5.5 x 10-6 Scm-1 at 30 °C, and increased with temperature to 1.5 x 10"5Scm_1 at 130 °C. A further increase in the temperature resulted in removal of phy-siadsorbed water from the pores of nanotubes, which coincides with a dramatic fall in conductivity to a value of approximately 5.6 x 10"8Scm_1. This low conductivity represents the electron conductivity of titanate nanotubes. The conductivity increased at higher temperatures, having an apparent activation energy of 0.57 eV and is higher than the conductivity of anatase or rutile nanoparticles. For instance, at a temperature of 225 °C, the conductivity for titanate nanotubes was ca. 7.9 x 10-7 S cm-1 (ref. 77), whereas the value for anatase nanoparticles of 6nm diameter was only ca. 10-9Scm-1 (ref. 78). Despite titanate nanotubes having a higher electrical conductivity than TiO2, their conductivity can still limit their application in fields where a higher electrical conductivity is required (see Chapter 6 for details). There are, however, several approaches to increase the electroconductivity of nanotubes. A reduction of titanate nanotubes at an elevated temperature under vacuum, or in a hydrogen atmosphere, results in the slow removal of lattice oxygen and the formation of oxygen vacancies. This process is usually accompanied by an increase in absorption in the visible range of the absorption spectrum, due to the formation of Ti31 centres, which can form Magneli phases (mainly Ti4O7 or Ti5O9). From a practical point of view, the synthesis of nanotubes containing significant Magneli phases would be of great interest since it would dramatically increase their electrical conductivity.79 The reverse electrochemical reduction of Ti41 to Ti31, accompanied by a change in colour of the transparent nanotubular titanate film deposited on electroconductive glass can be exploited in electrochromic devices.80 Another method for improving electrical conductivity is to prepare composites with other conductive materials, including: metals, carbon or conductive polymers.